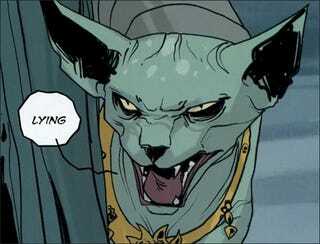 I just finished volumes one and two of Saga and now I need ALL THE COMICS. No, seriously, suggest me some comics. Preferably not Marvel or DC superhero things. I'm looking for stuff that's more like Saga, especially trades I can get off Amazon. I hate waiting for singles at the comic store. But Saga! My god! Guys, it is SO good. I love Lying Cat.